Precision shunts are very precise resistors inserted into a circuit in order to measure the current flowing through that circuit. The shunt does this by providing a very small voltage drop across its resistance proportional to the current flowing through the shunt. This can be clarified using Ohm’s Law, which states that the voltage will be equal to the current multiplied by the resistance (E=IR). Shunts are typically rated according to a full-scale current rating and the corresponding voltage output. The Riedon RSB-500-50 will handle a full-scale current of 500 amps with a corresponding 50mV output, this equates to a resistance value of 0.0001 ohm (R=E/I). 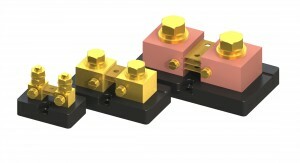 Various full-scale currents are available in industry standard 100mV and 50mV outputs. Other outputs may be available upon request. Full-scale current does not mean that the shunt will handle that amount of current continuously. As a matter of fact, it is common to de-rate the shunt by ⅔ to obtain a safe continuous current rating at ambient temperatures up to 40° C. The true limiting factor here is the thermal factor. It is essential that the resistive element of the shunt not exceed 145° C. At temperatures above this value, the resistive element will incur a permanent resistance shift and will no longer be accurate. For this reason, we recommend that you keep the resistance element at or below 125° C to provide even more margin of safety. In practice, the shunt is usually placed near the power source in order to minimize losses incurred by the connecting wire or bus-bar and to help ensure that the total current of the circuit is being measured. In order to minimize voltage potentials, it is best to place the shunt on the ground leg of the source. Riedon shunts are provided with “Kelvin connections” meaning that there are connections for the high current carrying part of the device and separate terminations for the voltage sensing. This is done to eliminate the voltage drop that would be present on the high-current conductors in order to help ensure the greatest accuracy.